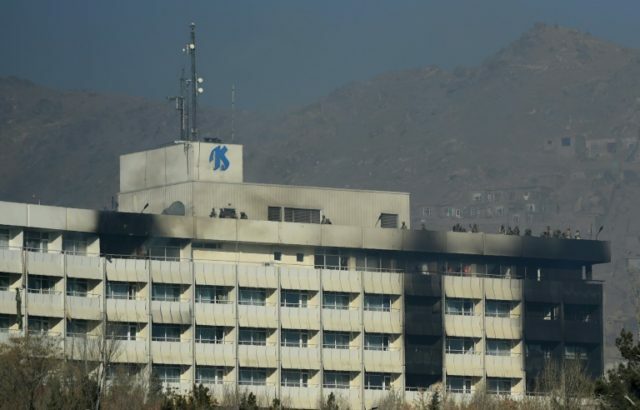 Kabul (AFP) – Gunmen stormed a luxury hotel in Kabul and killed at least six people including a foreigner, sparking a 12-hour battle that left terrified guests scrambling to escape and parts of the building ablaze. The Taliban claimed responsibility for the attack on the six-storey Intercontinental Hotel on a hilltop overlooking the Afghan capital. People trapped at the top of the building tied bedsheets together and climbed over balconies to escape the overnight assault. One lost his grip and fell in dramatic television footage by Afghanistan’s Tolo News station, which also showed black smoke and flames billowing from the top of the hotel. Special forces were lowered by helicopters during the night onto the roof of the landmark 1960s building, with Afghan security forces killing four attackers in the hours-long assault, the interior ministry said. “Five Afghans and one foreigner have been killed,” interior ministry deputy spokesman Nasrat Rahimi told AFP Sunday, adding around 150 people were rescued including more than 40 foreigners. An official with Afghanistan’s spy agency put the number of wounded at eight, while the interior ministry said six. Officials said four gunmen burst into the hotel, which is not part of the global InterContinental chain, on Saturday night, opening fire on guests and staff and taking dozens of people hostage. The Taliban claimed responsibility for the latest assault in the war-torn capital via an email from spokesman Zabiullah Mujahid. The interior ministry had earlier blamed the Taliban-affiliated Haqqani network. It followed security warnings in recent days to avoid hotels and other locations frequented by foreigners. Kabul has become one of the deadliest places in Afghanistan for civilians, with the Taliban and the Islamic State group both stepping up attacks. It was not clear how many people had been inside the hotel. During the siege, a guest hiding in a room said he could hear gunfire inside the building, where dozens of people attending an information technology conference on Sunday were staying. “I don’t know if the attackers are inside the hotel but I can hear gunfire from somewhere near the first floor,” the man, who did not want to be named, told AFP by telephone. Afghan Telecom regional director Aziz Tayeb, who was attending the IT conference, said he saw the attackers enter the hotel. Rahimi said the attackers were armed with light weapons and rocket-propelled grenades when they stormed the hotel, a popular venue for weddings, conferences and political gatherings. But the resurgent Taliban and Islamic State are both scaling up their assaults on the city, with multiple devastating attacks in recent weeks. The overnight siege is not the first time the Intercontinental has been targeted: in 2011 a suicide attack claimed by the Taliban killed 21 people there, including 10 civilians. Even before the attack was over Sunday, authorities were questioning how the attackers got past the hotel’s security, which was taken over by a private company three weeks ago, said Najib Danish, another interior ministry spokesman. A hotel employee told AFP that as he fled the staff living quarters in a building next to the hotel he saw the new security guards running for their lives.